Olivia Cooke shines in a leading role in Juan Carlos Medina’s gory and clever Victorian crime thriller The Limehouse Golem. Filmed on location in Keighley, Leeds and Manchester, The Golem is a serial killer who has left evidence of his gory murders all over the deprived Limehouse area of London. Fans of BBC/Amazon series Ripper Street will immediately be at home with the stylised setting which sees actress Cooke in a leading role as Elizabeth Cree – a former music hall entertainer – the chief suspect in the poisoning of her husband John Cree. 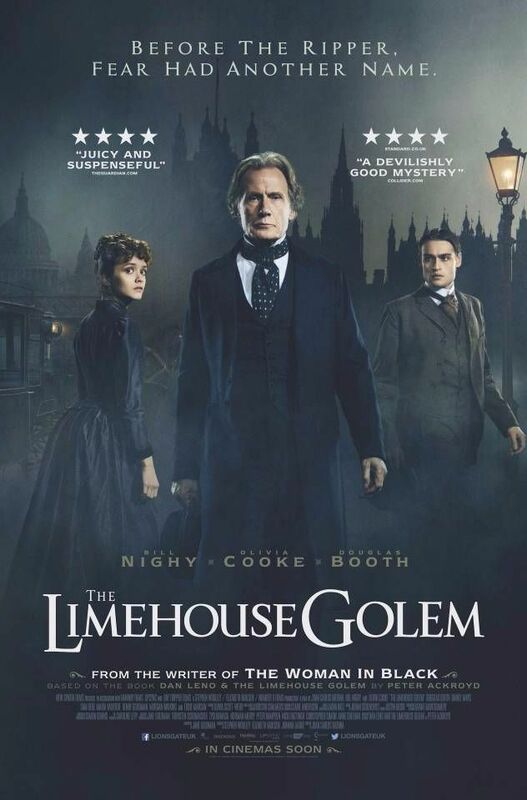 Bill Nighy plays Inspector John Kildare of Scotland Yard, newly appointed to the aforementioned Limehouse Golem case, and he has four suspects to investigate – John Cree, George Gissing, Dan Leno – a famous popular music hall entertainer, and Karl Marx (yes, that Karl Marx). Nighy replaced the late Alan Rickman who had to leave the role due to the illness which led to his death last year. The veteran actor admitted it was his first time playing a policeman and a role that he relished the chance to play despite challenging weather conditions during the shoot and you can see that in an understated yet engaging performance. Kildare is assisted by Constable George Flood (Daniel Mays, Made in Dagenham) – John Watson to Kildare’s Sherlock Holmes – and the investigation takes them across London from the British Museum to the Music Hall where Leno performs. There is a strong supporting cast, with Douglas Booth playing Dan Leno who takes the talented Elizabeth under his wing, Eddie Marsan playing Uncle – the shifty owner of the Music Hall, while Maria Valverde plays an acrobat who was jealous of Elizabeth’s success. In fact everyone seems to see something in Elizabeth and Kildare becomes convinced that she is not guilty of a crime that could see her hang and resolves to save her despite being reminded by Flood that he should concentrate on the Limehouse Golem case and on his own career. Jane Goldman’s adaptation of Peter Ackroyd’s 1994 novel “Dan Leno and The Limehouse Golem” begins as a densely plotted and graphic mystery crime pot boiler but eventually moves at pace towards a breathtaking finale with a neck-snapping twist of a finale. 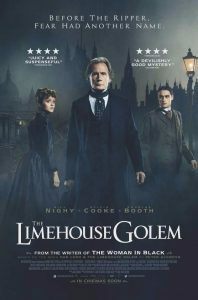 In a film where not everything is as it might initially seem, Goldman’s script is adept at picking out little plot asides which all add to the rich feminist tapestry of The Limehouse Golem and although a few of the many plot strands fail to hit the target by the time we’re heading towards the finale you’re on the edge of the seat with everything apparently becoming clear. Summary: THE LIMEHOUSE GOLEM is a period crime drama in which a detective investigates a series of murders in the hope of clearing a young woman’s name. This entry was posted in Shooting The Breeze and tagged Bill Nighy, Olivia Cooke, The Limehouse Golem. Bookmark the permalink.